Did you see my recent post about film locations along the Jurassic Coast? This time we move inland, including movies filmed in the historic manor houses and grounds of Mapperton and Athelhampton. Seen the film? Why not take a trip and visit one of these stately homes and gardens to experience the scenic locations in real life. Mapperton House is less than 20 minutes drive away from West Bay, just 5 miles northeast of Bridport. Athelhampton is about 40 minutes drive away, 5 miles east of Dorchester. Perhaps extend your visit and spend some time exploring Dorset’s county town, or the Iron Age fort of Maiden Castle, 2 miles south of Dorchester. Mapperton House has been the backdrop for several period dramas. The 1995 film Restoration was filmed at Mapperton House and Forde Abbey (in Somerset). 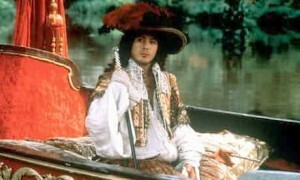 It is a costume drama starring Robert Downey Jr., Meg Ryan, Sam Neill and Hugh Grant. Set in the 1660s, Robert Downey Jr. plays a young doctor who falls out of favour with Charles II. 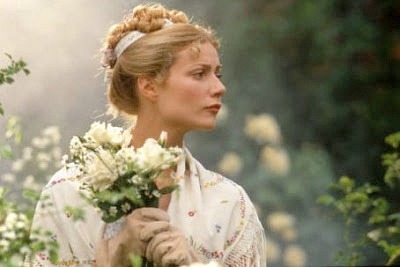 The adaption of Jane Austin’s Emma (1996), the tale of love and match-making, starred Gwyneth Paltrow, Jeremy Northam and Ewan McGregor. It was filmed in several Dorset and Somerset locations, including Mapperton House. In the 2015 film of Hardy’s Far from The Madding Crowd the house was transformed into Everdene Farm, the farmhouse Bathsheba inherits. Mapperton’s elegant front courtyard was turned into a mud-caked 19th century farmyard for the filming. 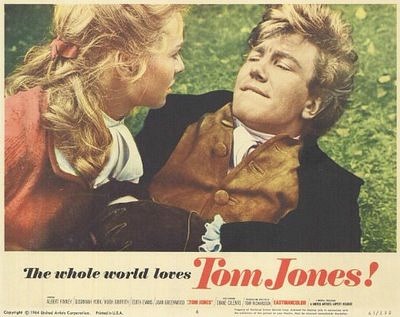 Tom Jones, the 1963 adaptation of the Henry Fielding classic, was filmed in twelve separate locations in Dorset and Somerset including Athelhampton House, Cerne Abbas, Beaminster and Nettlecombe (Somerset). It starred Albert Finney, Susannah York, Hugh Griffith, Edith Evans and Joan Greenwood. Tom Jones is set in 18th century Somerset and tells the story of a baby abandoned at a country manor who is raised by a kindly squire. 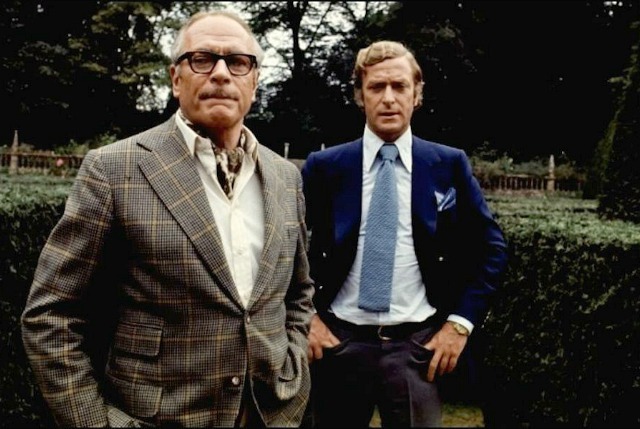 Athelhampton House and gardens were used as the main location in the 1972 mystery thriller Sleuth starring Laurence Olivier and Michael Caine. 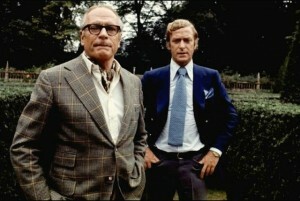 The house played the role of a large stately home in the Wiltshire countryside, belonging to Andrew Wyke (Olivier), a crime fiction author who invites hairdresser Milo Tindle (Caine) to his home after learning of his wife’s infidelity with him. A lethal game of cat and mouse follows and the film has one of cinema’s most memorable endings. Incidentally, the maze in the top picture was built in the grounds for the film, as were the gargoyles along the driveway in the opening shot. 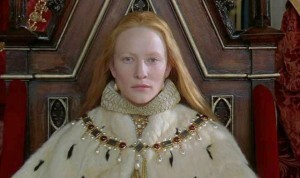 and the house interior was recreated in Pinewood Studios. The 15th century house was also used in 1998’s film Elizabeth starring Cate Blanchett, loosely based on the early years of Elizabeth I’s reign. 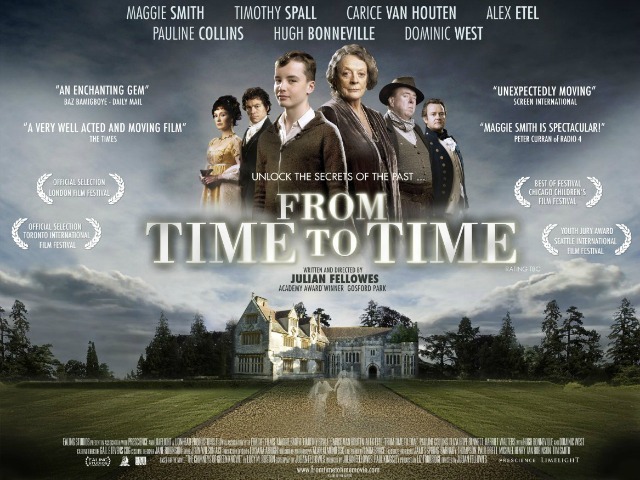 The children’s film From Time To Time (2009), directed by Julian Fellowes (who owns a manor house himself, West Stafford House near Dorchester) stars Maggie Smith, Timothy Spall, and local resident Harriet Walter. A WWII evacuee goes to stay at an aunt’s manor house, filmed at Athelhampton House and Julian Fellowes own home, which he discovers to be a timewarp portal to a past age. Nearby Puddletown was used for church and village square scenes. 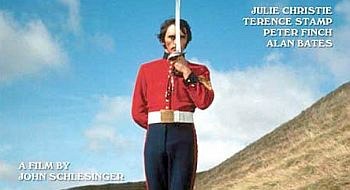 In the original 1967 adaptation of Far from the Madding Crowd Fanny’s meeting with Sergeant Troy (Terence Stamp) out with his Dragoons is up on the (then-unpaved) road over Eggardon Hill. Troy’s seduction-by-swordsmanship display takes place within Maiden Castle, south of Dorchester. 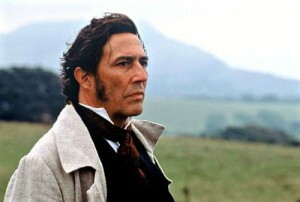 The 2003 TV film of The Mayor of Casterbridge starring Ciaran Hinds was filmed around Askerswell, Cerne Abbas, Maiden Castle, Stonebarrow and Lacock Abbey in Wiltshire. In the 1830s a group of six Dorset farm workers formed a union in an attempt to win a fair wage. They called a strike and were arrested and sentenced to be transported to Australia for seven years. Known as the Tolpuddle Martyrs, their story is central to trade union history. The film Comrades (1986) tells this story, with the first half of the film set in Dorset before the action moves to Australia. 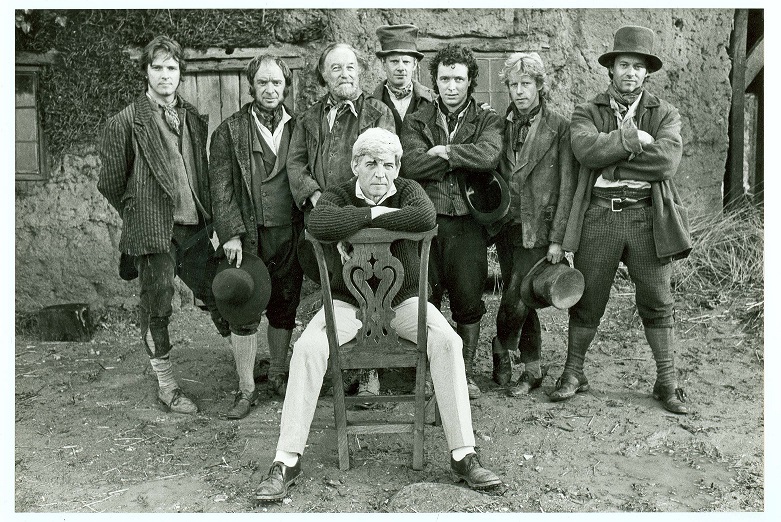 The village of Tolpuddle (8 miles east of Dorchester) had become too modern to be authentic for the 1830s setting and so the Tolpuddle scenes were actually filmed in the abandoned village of Tyneham in South Dorset (which had been taken over by the army after the Second World War). Other key scenes were shot in Dorchester where streets were dressed to look early Victorian, including hundreds of sheep. Half way up High Street West there is a plaque on the wall of the courthouse where the martyrs were tried and found guilty, and this was the location the film used for the same purpose. Gemma Arterton starred in BBC TV adaptation of Tess of the D’Urbevilles in 2008 and returned to Dorset in 2010 to star in the film Tamara Drewe. This tale is a modern take on the Thomas Hardy novel Far from The Madding Crowd. 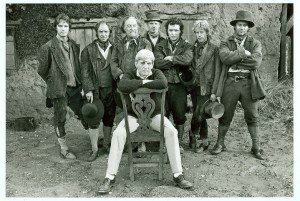 Scenes were filmed in and around the picturesque village of Salwayash, near Bridport, with Arterton returning home to beguile the men of a small Dorset village.